It's shaping up to be another busy session Thursday. 1. Mega bank settlement: Keep your eye on Bank of America (BAC) stock when trading begins. The bank has tentatively agreed to pay more than $16.5 billion in what would be the biggest ever settlement related to a mortgage securities fraud case. However, no final agreement is expected to be announced this week as the details continue to be negotiated. The bank's shares edged up in premarket trading. 2. Quarterly earnings: A slew of companies are reporting earnings Thursday. Wendy's (WEN) is one of the big names reporting before the opening bell, while CBS (CBS), News Corp. (NWS) and game developer Zynga (ZNGA) will report after the close. 3. Ukraine crisis: Russia has imposed a ban on imports of beef, pork, fruit and vegetables, poultry, fish, cheeses, and milk from Europe, the U.S., Australia, Canada and Norway in retaliation for Western sanctions. The escalating trade war threatens Europe's fragile economic recovery and is hurting some companies. Shares in German defense contractor Rheinmetall fell 9% Thursday after it warned that Russian sanctions would hit 2014 earnings. Germany has canceled an export license for a big Rheinmetall contract with Russia. The European Central Bank is highly unlikely to announce new measures to stimulate the economy at Thursday's meeting but may issue more words of comfort. "ECB President Mario Draghi is likely to recognize the current challenges from geopolitics, banking reform, and weak growth and if he doesn't make further dovish noises, we'll all be surprised," said Kit Juckes, a market strategist at Societe Generale. 4. Market movers: Shares in Keurig Green Mountain (GMCR) dropped in extended trading because quarterly revenues weren't as strong as hoped. Shares in 21st Century Fox (FOXA) were up in extended trading after the company reported revenue and profits that beat expectations, driven by box office success. Adidas (ADDYY) continued to decline in Europe, down by another 3% Thursday, after the sportswear company reported that unfavorable currency moves and an 18% drop in golf sales were hurting its bottom line. Shares in Adidas have sunk by 20% since the company warned last week its earnings were not doing well. Shares in Transocean (RIG) rose in premarket trading after the Swiss offshore drilling company reported strong growth in quarterly earnings y despite a dip in revenue. Carnival (CCL) shares were also edging higher before the open. 5. U.S. economic announcements: The U.S Department of Labor will post weekly jobless claims at 8:30 a.m. ET. Then at 3 p.m., the Federal Reserve will release consumer credit data for June. 6. Wednesday market recap: U.S. stocks closed higher Wednesday, but barely. 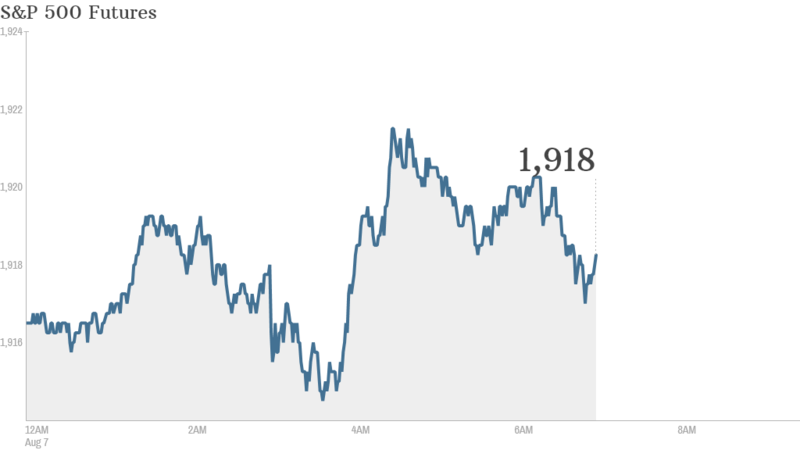 The Dow added about 14 points, while the S&P 500 and Nasdaq were pretty much flat.